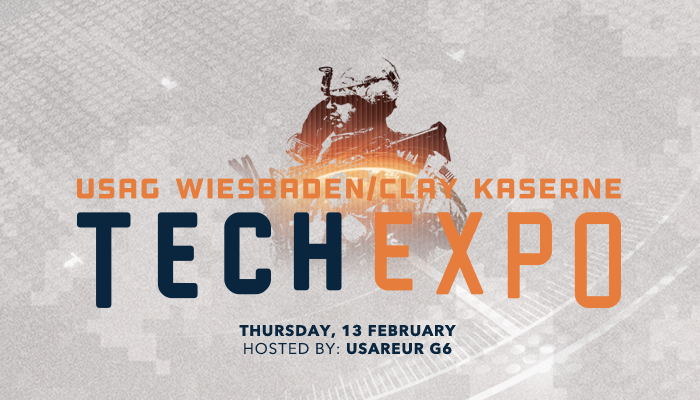 The USAG Wiesbaden/Clay Kaserne Tech Expo will be taking place on Thursday, 25 July – Friday, 26 July, 2019 at the Wiesbaden Fitness Center. The Tech Expo is an event to bring government and industry together to collaborate on mission requirements and technology solutions in an open environment. Industry partners will be showcasing the latest mission-centric technologies. This is an opportunity for the organizations and units structured under the USAG Wiesbaden, USAREUR HQ, and other tenant units to see the latest in emerging technologies, network with industry experts, and share ideas and future goals. 0900-1000 Senior Leadership Tour: This is a unique chance for Senior Leadership to come together and preview the exhibits in a time-efficient manner. Each exhibitor will give a one-minute presentation of available products and services. 1000-1300 Tech Expo: This is open to all personnel to come out and network.